The Treasure Coast should have been called the "No Vegan Food Coast," but I guess that was too long to name it that. I was able to find some things I could eat at an Indian restaurant a few nights ago so my next thought was to try Thai. 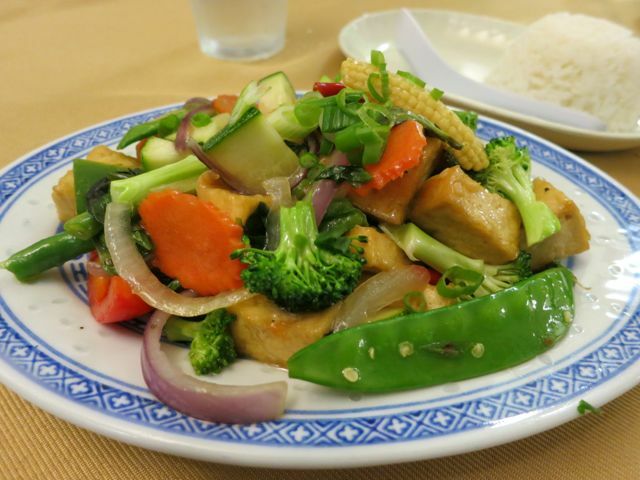 After a pretty bad experience at another local Thai restaurant, Siam City, that had almost no vegan food on a 16-page menu, I called another Thai restaurant in town before making the trek. 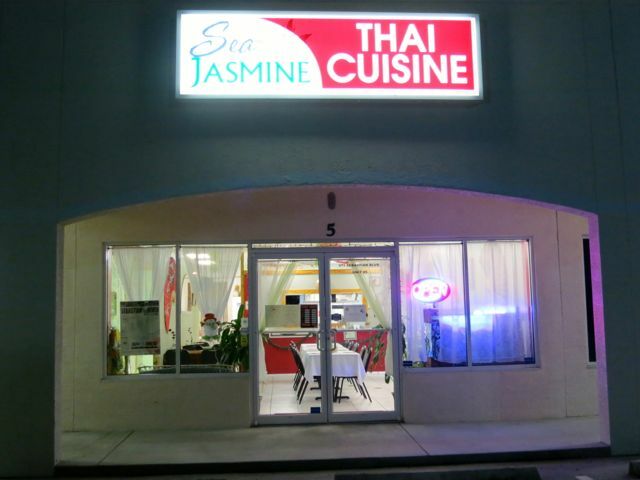 To my delight, Sea Jasmine Thai Cuisine seemed more than happy to accommodate so we all headed out to this restaurant. As relatively new restaurant owners, Scott (also the chef), and his mother seem eager to please. There was only one other couple when we arrived so Chef Scott brought us some water as we waited for the rest of our party and reassured us that he could make us whatever we wanted. It is a fairly small restaurant located in Sebastian, Florida with white tile floors and colorful walls, decorated with plants and Asian fans. 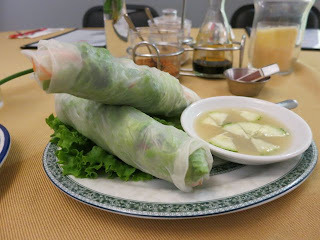 We started with an appetizer of spring rolls. These rolls were filled with lettuce, carrots, and cilantro and served with a light sauce with cucumbers. They were pretty good. Then, to our surprise, the chef brought us each a gift of a soup. He made a special vegan one for me that was absolutely delicious and incredibly fresh. 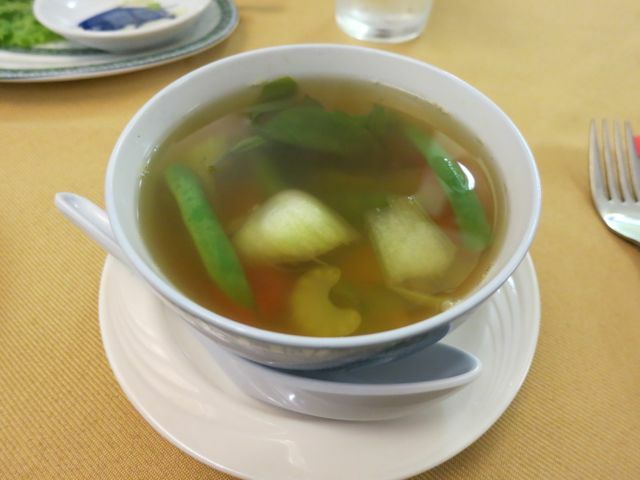 It was a clear broth soup loaded with chunky veggies like celery, red peppers, bamboo, carrots, cilantro, and lemongrass. Scott said that he sourced as much as he could from the local farm. Love supporting local farms! For my entree, I just described the type of dish I wanted and the chef made it for me. He took fresh cut broccoli, carrots, red onions, green beans, scallions, zucchini, Thai chiles, and fried tofu and tossed it in a sweet and sour sauce. Although I asked for really spicy, it wasn't as spicy as I had hoped so he advised me to use the housemade spice mix that is on the table. And when I say housemade, I mean he dries his own chiles, grinds them into a powder and creates the mix fresh. Wow - now that was hot! It was a very tasty dish. 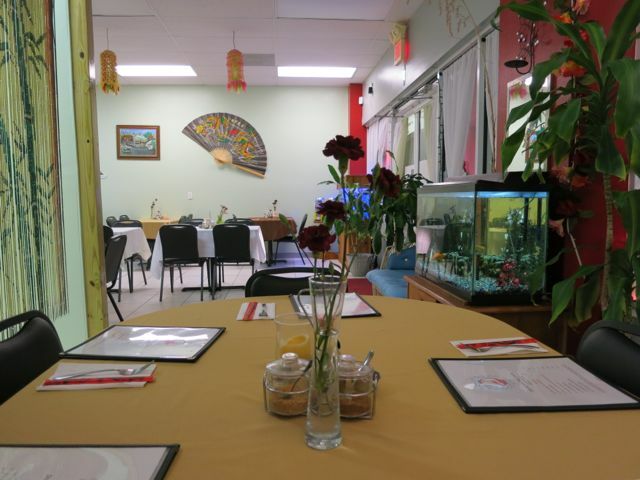 Overall, everyone was very pleased with their dishes, the prices, and the service. 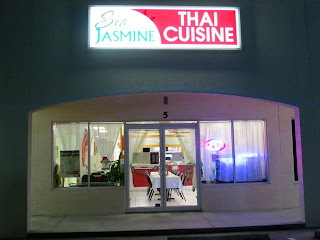 This was my favorite place to eat during my week in the Treasure Coast area. This sounds like a great place, how nice about the soup! I only wish every Thai restaurant was so accommodating.